Sean Bonar: has connections around Glasgow area. 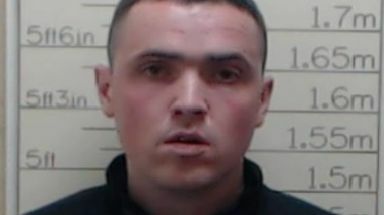 Members of the public have been warned not to approach a violent prisoner after he absconded from a jail near Dundee. Sean Bonar, 29, breached the terms of his licence when he failed to return to HMP Castle Huntly on Monday. Police have launched a hunt for Bonar, who has connections in the Glasgow area. He is described as 5ft 9in, of average build with short dark hair. Members of the public have been warned not to approach Bonar if they see him but to call Police Scotland on 101 or 999. A Scottish Prison Service spokeswoman said: "A rigorous risk assessment is undertaken prior to any offender being granted unescorted leave. "The majority of these take place without incident. Those on home leave are released on licence conditions. "Where an individual breaches their licence conditions, the Scottish Prison Service will work with Police Scotland to apprehend the individual who is now unlawfully at large."